I was watching a Top Chefs Duel episode with Stephanie Izard and was intrigued by the halibut dish that she prepared the judges all fawned over. I’m always looking for seafood recipes outside of roasting them whole so I was glad to buy a nice halibut piece from Chelsea Market’s Lobster Place to try it. I found the recipe on Food & Wine but made changes when, surprisingly, my neighborhood grocery store did not have ground pork the day I stopped by. I also didn’t want to walk an avenue away to pick up tamarind from the Mexican store (I’ve seen them there before outside of Chinatown), so I ended up buying the smallest bottle of pomegranate juice I can find to substitute. I would have cooked the Pom juice down for a thicker consistency, but the recipe needed a scant amount so I just threw it in for its tartiness. 1. Make the cilantro sauce. In a food processor, purée the cilantro, olive oil, vinegar, mustard and honey. Season with salt and pepper. Set aside. 2. Cook the veal. Heat some peanut oil in a saucepan. Add the shallot and garlic and cook until softened. Add the veal and cook over moderately high heat, breaking up the meat, until browned. Add the sugar, miso, pomegranate, peanuts and 1/2 cup of water to the pork. Simmer over moderately low heat until thickened, 2 minutes. Season with salt and pepper; stir in the lime juice and keep warm. 3. Cook the fish. In a nonstick skillet, heat the remaining 2 tablespoons of peanut oil. Season the halibut with salt and pepper. Cook over moderately high heat until browned and just cooked through, about 4 minutes per side. 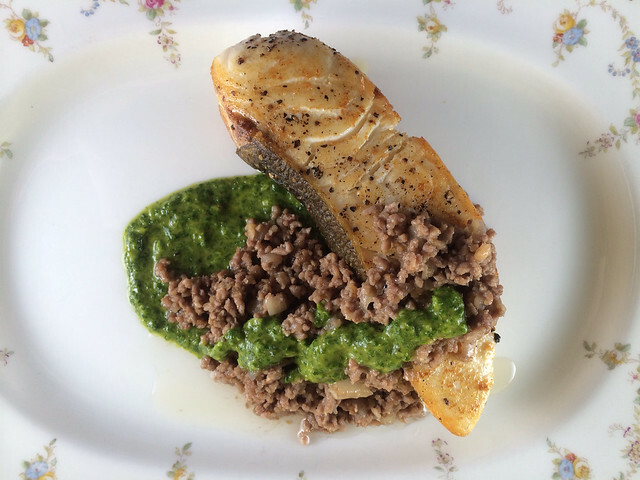 Set the fish on a plate and top with the veal and cilantro sauce.